January 20, 2019 April 13, 2019 - The 'Noms. So we made some homemade Banana Liqueur! What would you do with 80 pounds of bananas? This was a situation that we found ourselves in, when we had a friend drop off two 40 pound cases of bananas! Well one can only make so many loaves of banana bread! With us being enterprising cocktail writers, we started to look for ways to use bananas in cocktails. 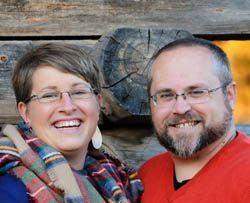 This is not as easy a task as you might think! in comes our Homemade Banana Liqueur! Maybe it’s because bananas don’t easily translate into juice, and frankly a mushed banana really isn’t the most appealing looking ingredient, but we wanted to start looking for a way to get that banana flavor with out a pulpy, mushy mess! 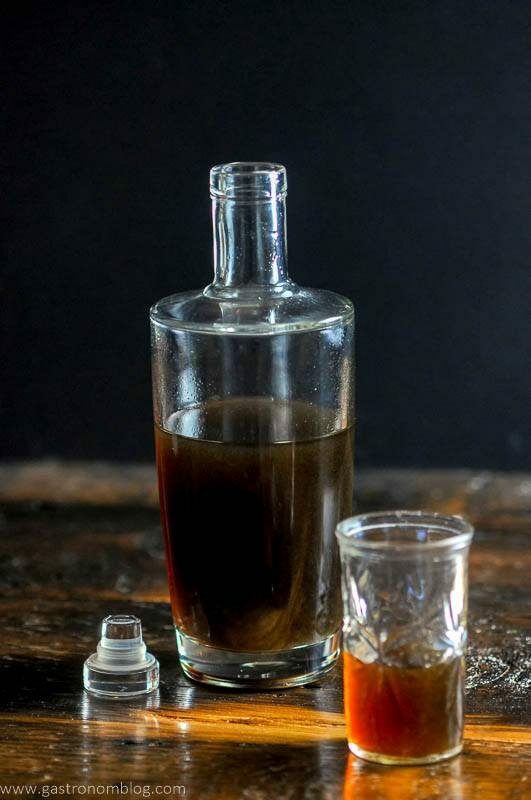 One way to get a flavor is to make an infusion or a liqueur and let the alcohol pick up the flavor while skipping the mess you would get by adding the raw ingredients to your cocktail. You can use all kinds of ingredients to infuse spirits, from fresh fruit, herbs or even things like flowers! Whats the difference between and infusion and a liqueur? With an infusion, you simply let the spirits pick up the flavors from whatever ingredient you are infusing. To make a liqueur, you infuse a spirit (gin, vodka, whiskey, etc) with an ingredient, and then finish by mixing in some sweetener to create a sweeter flavored spirit. The mixing in the sweetener reduces the alcohol content down to a lower amount than just the base spirit, making the liqueur smoother. Liqueurs are often used as dessert shots or to add intense bits of flavor to drinks. We made an Allspice Dram, which is an allspice liqueur! 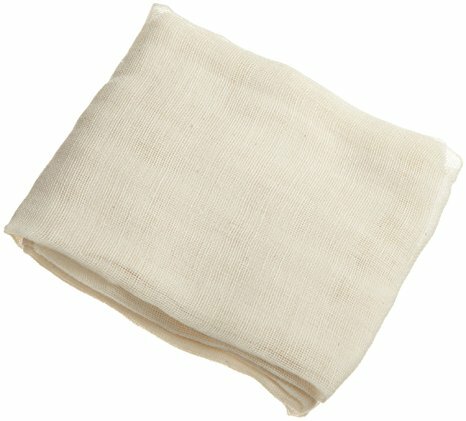 We have been reading about a lot about people using bananas in cocktails, but it had never been an ingredient that we wanted to use. This was because all the banana flavored spirits we had tried tended to be that fake banana flavor that reminded us of horrible kid’s medicine. 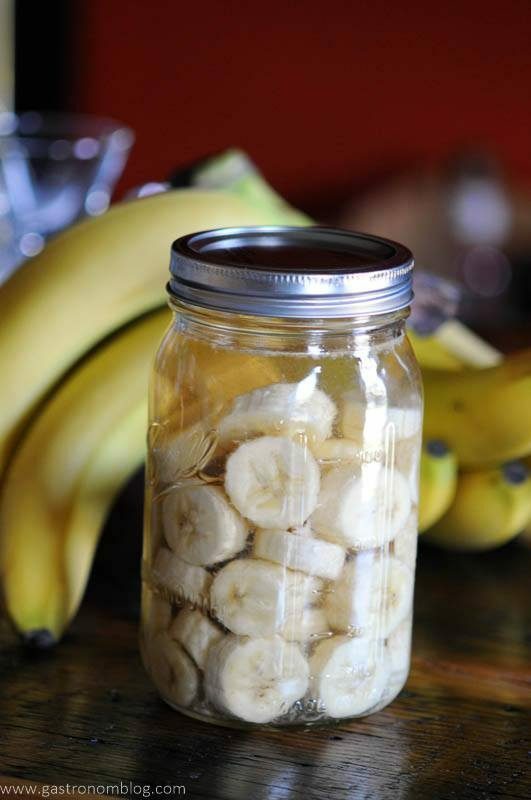 When we came into our bounty of bananas, one of our ideas we had was to make a really great DIY banana liqueur. But where to start? How do You Make a DIY LIqueur? We did a little research and saw lots of recipes for infusing bananas in vodka, but we wanted something that would be more than just straight banana flavor. Knowing that bananas come from the tropics, why not pair up some bananas with the spirit of the tropics, rum! Bananas and rum are a great combination. The caramel and vanilla flavors commonly found in rum works very well to pull out and enhance the banana flavor. Besides, the rum as a whole lot more flavor than vodka! For our homemade banana liqueur, we started out with some beautiful ripe bananas. When we say ripe bananas, we mean those bananas that are still bright yellow, with just a few brown spots. You want a banana that still is firm, but has sweetened up to just before that peak banana flavor. Aka its not the bananas that you want to use for banana bread! 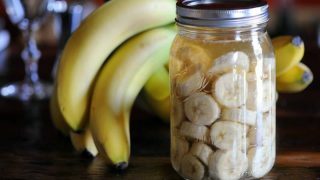 Slice the bananas into pieces about 1/4th an inch thick and then put them into a mason jar or tightly sealable container. We prefer glass over plastic as glass doesn’t tend to keep flavors from other foods or drinks that you stored in that container! After filling the jar with the sliced bananas, its time to infuse some rum! Because we are big fans of Tiki drinks, we wanted a banana liqueur that would have a little character. We decided to embrace one of the tenants of Tiki, layering rums! 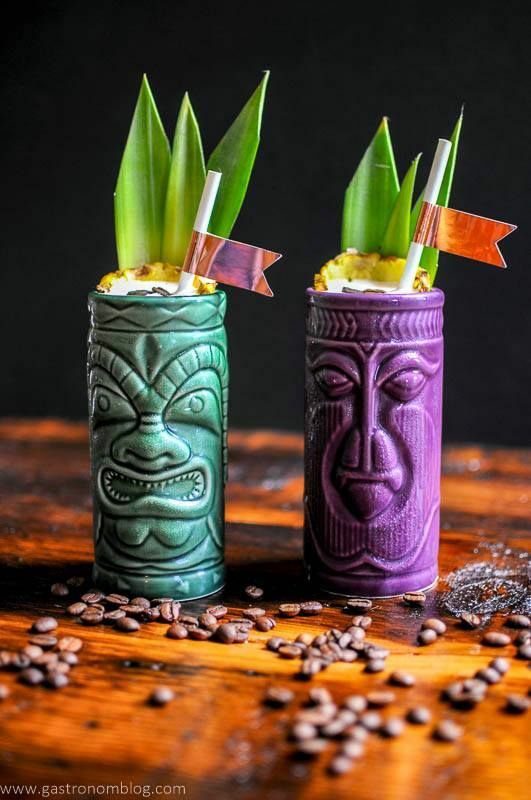 In a lot of Tiki recipes, they blend different kinds of rum together to bring the characteristics of different styles of rum to the drink. Following in those footsteps, we decided to go with a blend of aged rum and plain white rum. What Ingredients are Needed for the Banana Liqueur? Why go with this blend of two rums? White rums tend to be light and sweet with a real spicy spirit flavor and light hints of vanilla and brown sugar. The aged rum has a little more mellow flavor, with stronger hints of brown sugar, molasses and hints of winter spices. When combined together, the two rums bring all these flavors to the banana liqueur. This makes for a richer tropical flavor that really enhances the banana flavor! After a few days of the banana’s soaking in the rum, its time to make the liqueur! 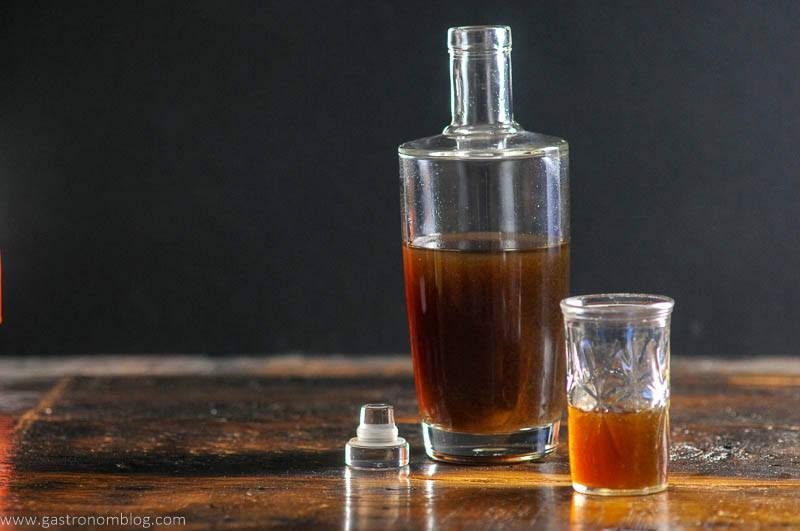 Most liqueurs tend to be sweeter and lower proof, and this banana liqueur is no exception! After soaking, the banana slices are starting to turn to mush, so we filtered out the banana slices. Once we have the spirits filtered, its time to mix in a little syrup to dilute and sweeten the liqueur. Once the syrup and the spirits are combined, its time to mix with some cocktails! 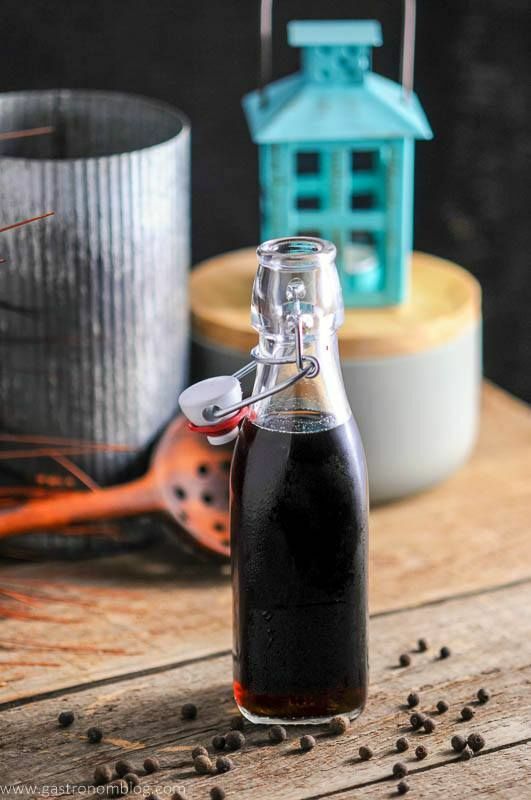 We loved the way that this homemade banana liqueur brought a fresh banana flavor while still bringing a hint of dark tropical sweetness. 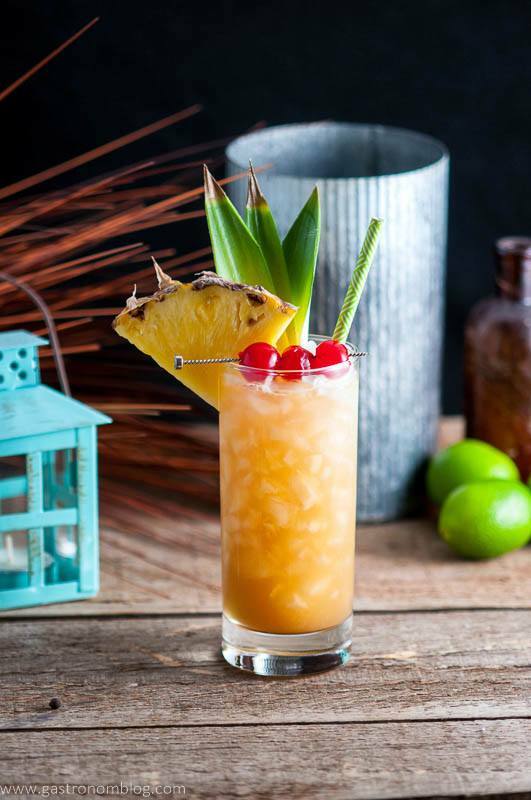 This flavor worked really well when blended into Tiki cocktails and will definitely transport you right to the tropics! 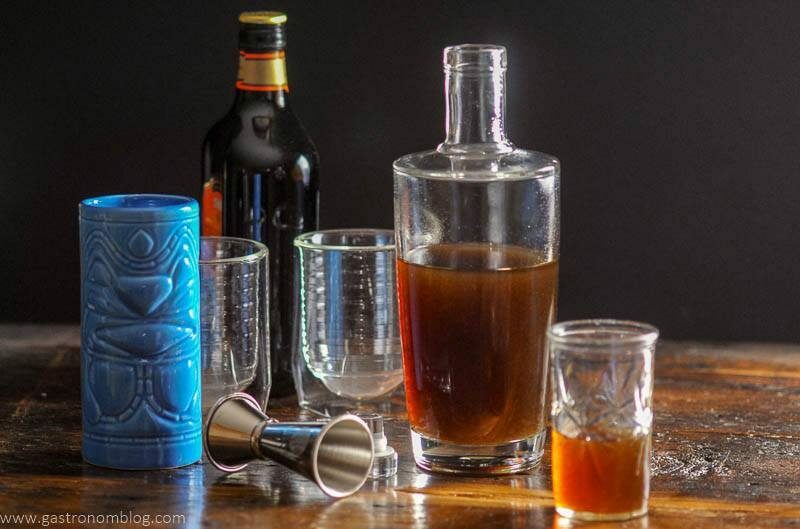 This homemade banana liqueur is perfect in tropical cocktails and tiki drinks! Cut bananas into slices. 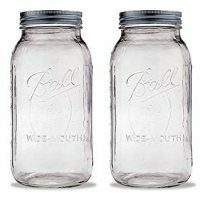 Place in glass jar. Top with rums and shake. Seal the lid and let sit for at least 3 days. 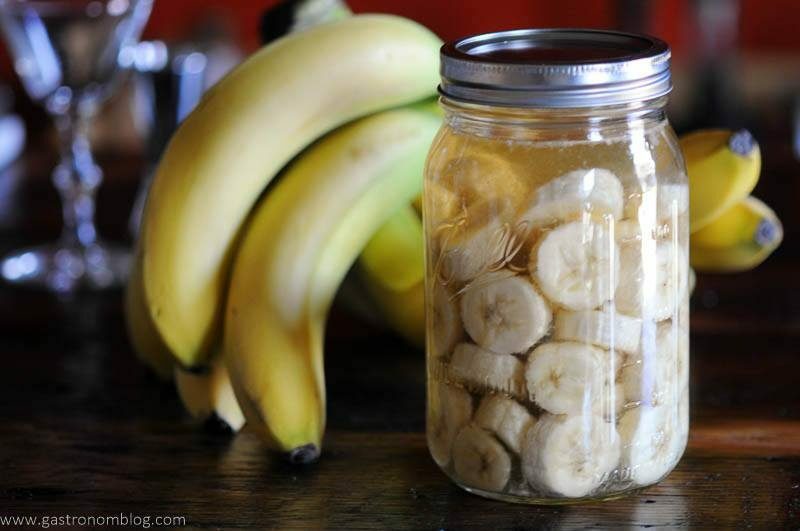 When the infusing time is finished, strain out the bananas and throw away. 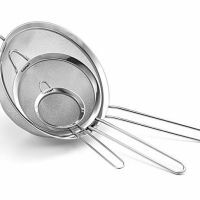 You may need a fine mesh sieve to get all the particles out. Heat the sugar and water on the stove, bring to a boil. Let sit to cool. 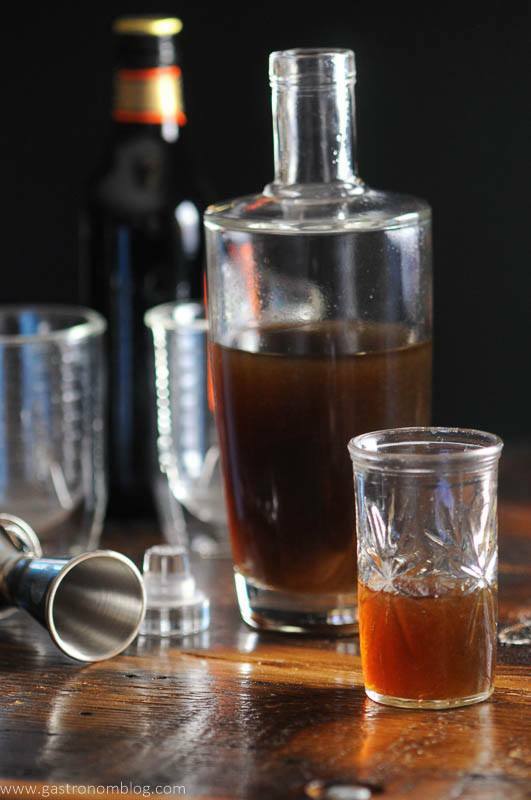 Pour the rum infusion and the simple syrup into a clean jar or empty liquor bottle. PIN THIS HOMEMADE BANANA LIQUEUR RECIPE FOR LATER! Haha – exactly! Hope you try it and enjoy. Cheers!